Updated game times per new update from newsok.com at Wednesday Nov. 7th 1:30 AM : Ringwood @ Shattuck moved to 7 PM, Seiling @ Pioneer-Pleasant-Vale moved to 7 PM, Waukomis @ Laverne moved to 7 PM. 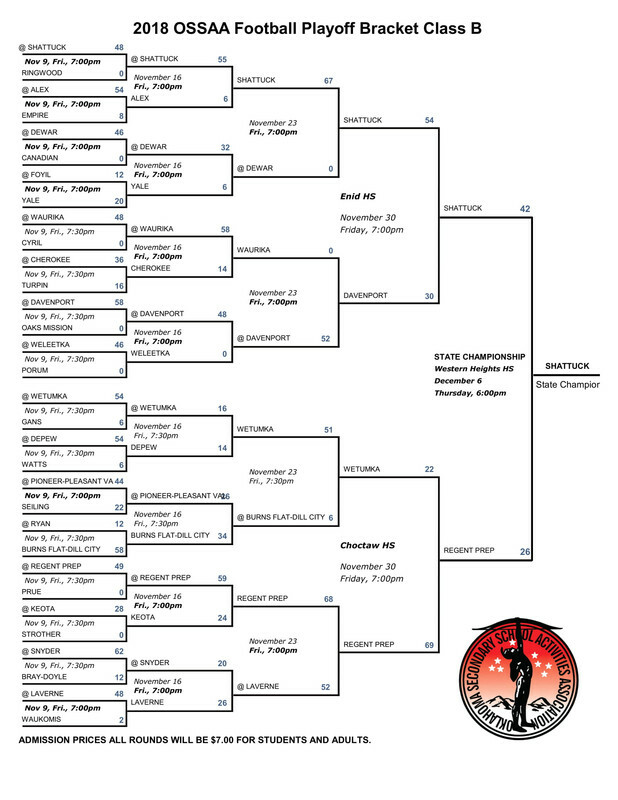 OSSAA has updated their brackets to reflect the new times. Click link in 1st post. OSSAA showing Canadian @ Dewar at 7:00 PM so time updated in first post. Updated OSSAA links and game times. CONGRATULATIONS TO THE 2018 OSSAA CLASS B FOOTBALL STATE CHAMPION SHATTUCK INDIANS!!!! Final update: updated link to completed bracket and added jpg image.